While getting a better feel for my neighbourhood in Chicago — Logan Square — and surrounding neighbourhoods, I passed by an Afghani restaurant that isn’t far from my favourite Algerian restaurant and a seafood market that I frequent. 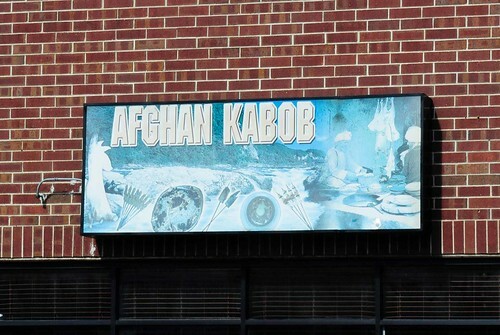 I had become a fan of Afghani food years ago when I started Chicago Alphabet Soup and was surprised that out of all the Middle Eastern restaurants in the city, there weren’t more Afghani restaurants. Well, it appears that I had not been looking hard enough. After finding Afghan Kabob at 4040 W. Montrose Street, I shall have to embark on a quest to find some sister restaurants. Spacious and bright on the inside, Afghan Kabob is not big on interior pizzazz. Since my appetite takes precedence over all else, flavour is what I expect once I take a seat. And flavour is exactly what I got. I had used Kabul House, the first Afghani restaurant I had gone to, as my benchmark and was prepared to be let down. The biggest letdown was having eaten too much and wanting more with no more room for additional indulgence. 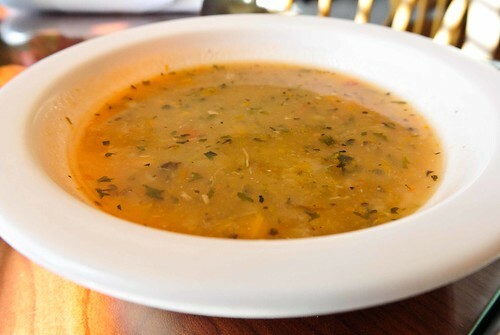 For starting, there was a complimentary bowl of chicken vegetable soup. Let’s be clear that this was neither Campbell’s nor Progresso soup. Some may argue the observation, but when the tongue doesn’t feel weighted with salt, you know you are having something that took time to prepare in the restaurant’s kitchen, not in a colossal industrial vat. The soup is not overburdened with chicken, so the broth and the vegetables stand out more. Wanting to try several small dishes, I opted for a round of four appetizers. 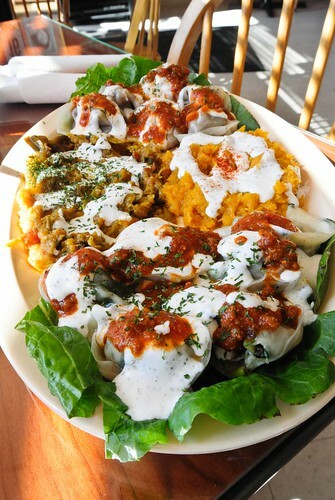 There were butternut squash, boranee baunjan, vegetarian mantoo, and beef mantoo, all served over lettuce and topped with yogurt. I forced myself to spend the rest of the day alone so that I would not drive my friends crazy talking about how delicious the butternut squash was. That and the wow factor in the bloom of flavour from the eggplant in the boranee baunjan were so addictive that I could have eaten those two only. Although the beef mantoo was lighter than expected, those dumplings were a big hit and the vegetarian mantoo was a bigger hit. Add to that the homemade Afghan bread that came with the platter, there was very little washing required of the plate after I went all around the plate with the bread. I wondered why it took me so long to find my way to Afghan Kabob. In a few of my recent posts, I mentioned that I have been doing CrossFit training so that I can add a few pounds. Yes, I know that some people are focused primarily on losing weight while I am going in the opposite direction. But my bulking up requires me to have a little more protein intake in my diet. So, I have started having more allowances for chicken. Being a lover of spicy food, I ordered chicken korma chalaw with rice. 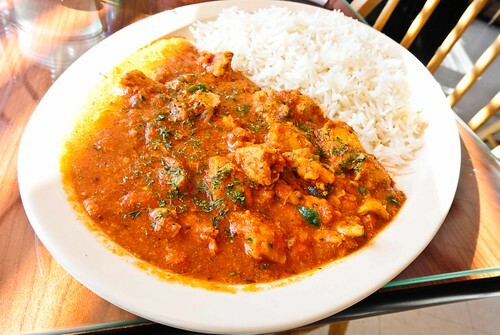 The spicy tomato-based gravy with succulent cubes of chicken and rice was absolutely divine to the taste buds. Middle Eastern food may pack a flavourful punch, but it is rarely spicy, so the fact that the chicken korma chalaw came spicy without killing the senses in my tongue made the dish a fantastic lunch option. 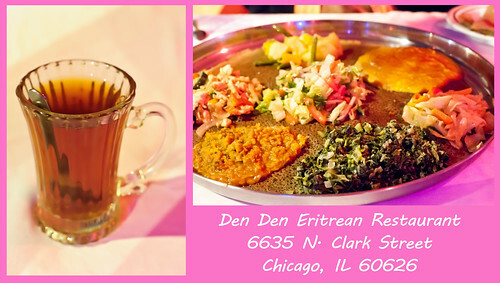 Those in the metropolitan Chicago area will find that the triangle section of Elston Avenue, Montrose Street, and Pulaski Avenue houses a mixture of North Africa and the Middle East. It could feel like being abroad. 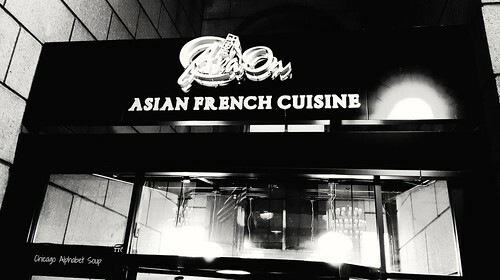 The beauty of that cultural diversity is that the food in the restaurants and small cafes retain its authenticity. 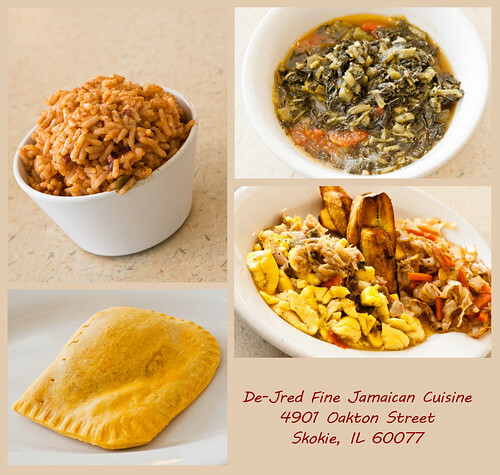 The restaurants I have gone to in that area of Irving Park have been most addictive not only from a culinary aspect but also from an inviting standpoint. Any restaurant that welcomes you without pretense and leaves you wanting to return for more of its kitchen delights deserves repeat visits. I shall see you again, Afghan Kabob. A few years ago, I left a company that was couched in political maneuvering and led by a chief executive officer who let it be known that the employees’ “measly” 2% pay increases were a small sacrifice — so that the Board of Directors could get their 25% pay increases. It was on to another company that was couched even deeper in political madness with a revolving door of contractors and permanent employees who came and went, and a management staff that consisted of supervisors and managers in title only. About two years ago, there began flight from the latter company and recently the company had a reduction in workforce. Several of us who had become good friends while working together had fled and we all remained in touch. We decided that it was time for a gathering. You can never have a proper reunion without food. 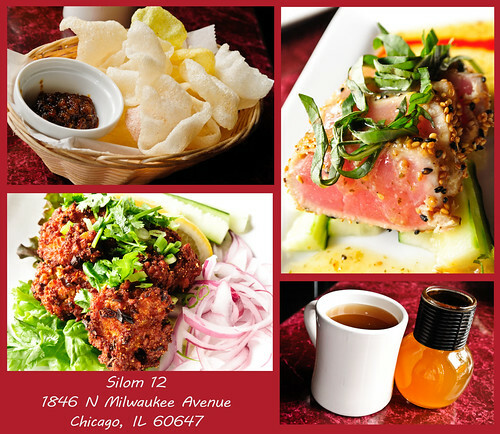 And with one of us knowing the owner of one of Chicago’s most popular Chinese restaurants, a date was set and there were a Chinese, an African-American, an Indian, a West Indian, and a Filipino walking into Lao You Ju at 2002 S. Wentworth Avenue in Chicago’s Chinatown. Sounds like the introduction to a joke, right? No, it was just five former colleagues gathering for laughter and some authentic Chinese food. 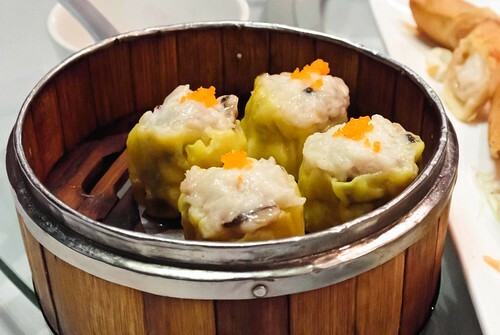 Lao You Ju boasts a swell menu of dim sum, Hong Kong style. 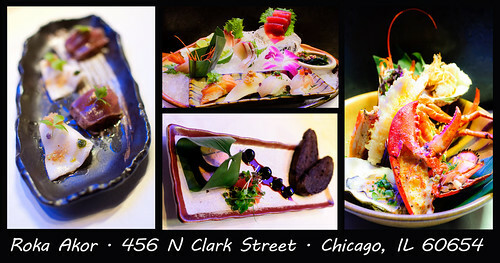 There are indeed some exotic menu items that the modest palate may find visually intriguing, but not necessarily tasteful. 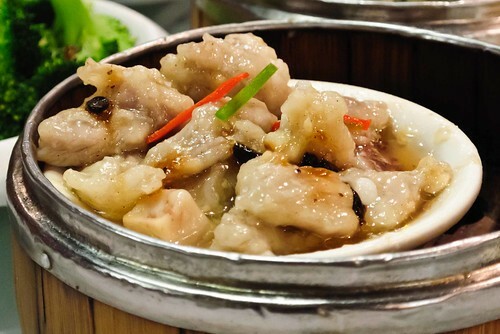 For the five of us who had gathered, our palates are varied, so we played it safely while indulging one or two items that are more commonplace in the Chinese culinary space. Because we had opted mostly for dim sum, we started with satay chicken and preserved egg pork congee. 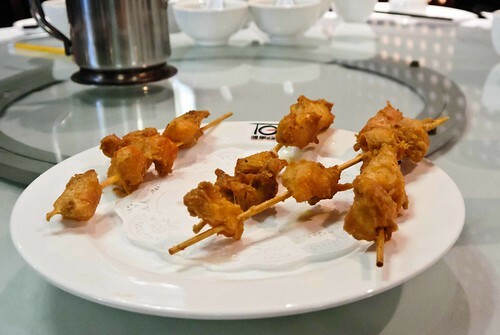 Satay chicken is nothing more than well-seasoned chicken skewered onto wooden sticks. 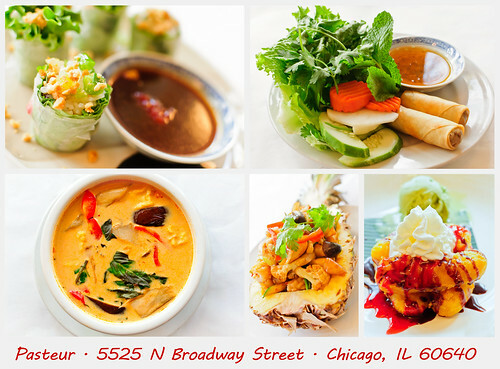 Many of you will have had satay chicken with peanut sauce at Thai restaurants. There was no sauce with the dish at Lao You Ju, as it was rather flavourful sans it. 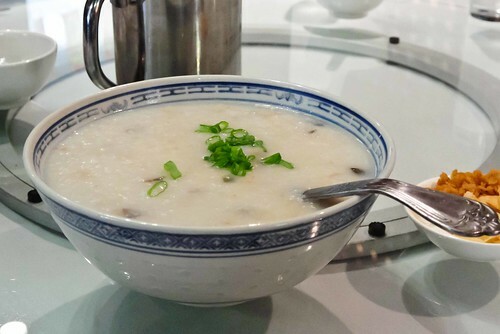 The congee came in a communal size bowl, rice porridge for an insatiable appetite. We filled our cups and went to work. 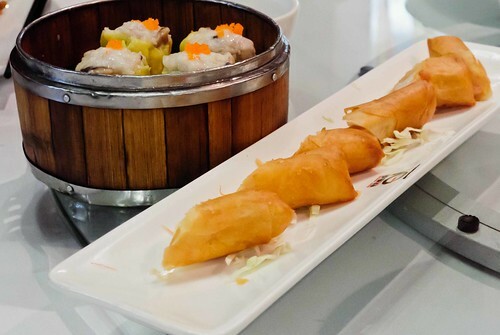 While talking about another former colleague who used to take random vacations “off the books” and then return 3 to 4 weeks later as though it was “only a thing,” there arrived cheese rolls with shrimp and shumai. The cheese rolls were like crispy egg rolls that encased cream cheese and plump shrimp. At a lot of Americanized Chinese restaurants, some syrupy dipping sauce would have accompanied the rolls. For those of us at the table, we were quite glad to not have some side order usurping the flavour of the rolls with a punch of unnecessary sweetness. Along with the cheese rolls with shrimp came some shumai. 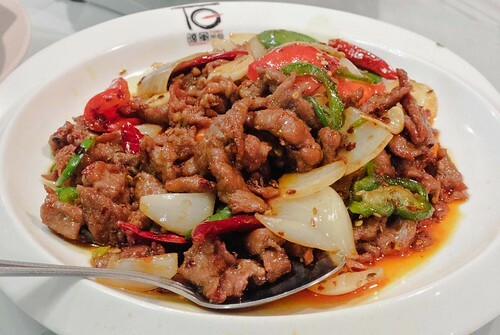 Having forgotten that pork was a heavy staple in the Chinese diet, we tackled them anyway. 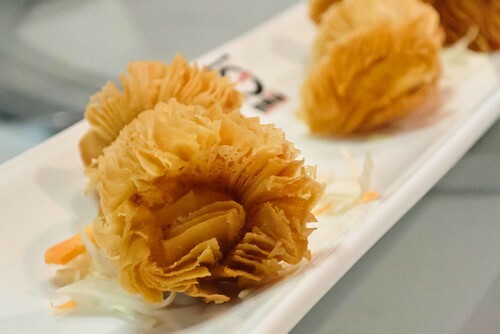 Rather than requesting that the recipe be modified and erasing authenticity, we gobbled the shumai without complaint — and then realized after we had completed them that we didn’t dunk them in any sauce before devouring them. We laughed about how the business analysts, Business Intelligence analysts, and quality assurance team could never seem to work as good as they could have together thanks to interference from management and the fact that information technology is becoming more about service than it is about solutions. Right about this time was when we got to indulge ourselves in some jin-sha shrimp. General chicken what? Kung pao chicken what? Beef with broccoli what? 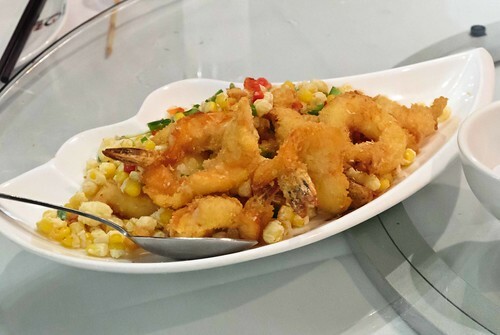 I am in love with this whole concept of fried corn with peppers and breaded shrimp. Put some orange chicken in front of me and I will be inclined to throw it against the wall. 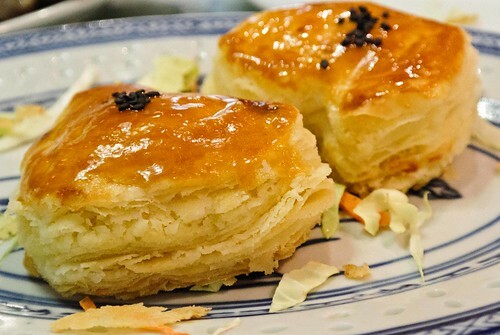 To make matters ever more tastefully exciting, there were crispy papaya pastry served. They looked way too twee to have experienced the grinding of our teeth on them. The natural sweetness of the papaya made them that more pleasing to the palates because we got to taste the fruit in all of its bloom. Two weeks after I had left the company, I got a text message from one of my friends who was at dim sum lunch with us. He had left to go abroad to get married and to have his honeymoon with his wife. When the text message had come across and he discovered the address of where I was working, it turned out that he had accepted a position with a company across the street. Not only is the world flat, but it is indeed very small. We all laughed about that story and chuckled when the small dish of beef tripe was placed in front of us. 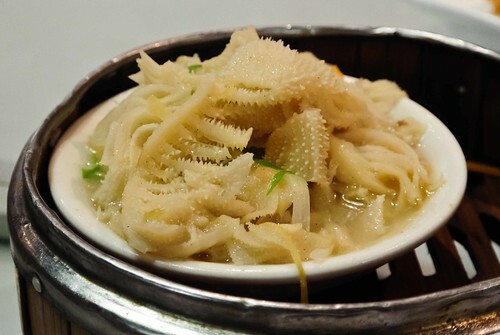 Tripe, to me, is one of those menu items that shows that cooks will spare no parts. The texture is akin to that of a rubber band, which may not be endearing to many diners. The recipe for the beef trip at Lao You Ju was surprisingly worthy, although I will never get accustomed to having to chew, chew, chew, and chew some more before swallowing it. As to the lamb hot sizzling plate, this spicy dish was a winner. 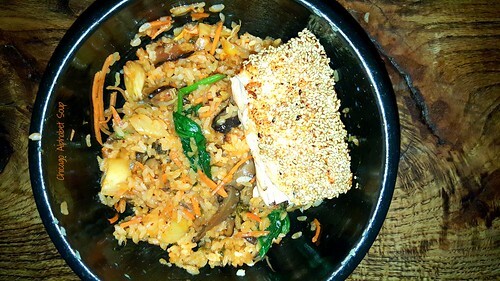 Served with white rice, we worked our chopsticks in true fashion. Move over, Greeks, because you’re not longer the standard bearers of cooking outstanding lamb dishes. 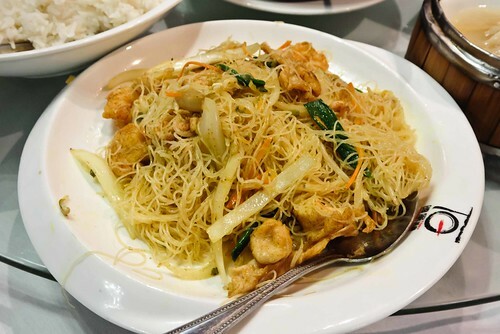 The Singapore fried rice noodles with chicken was another one of those dishes that will make you want to take up a picket sign and advocate for the closure of all the China Buffet restaurants in the world. And from there, you will probably march in front of every Chop Suey hole in the wall that is open for business. Let’s just say that we didn’t leave any noodles or gravy on the plate — and we all used chopsticks. I have had Singapore fried rice noodles prepared correctly, so I shall not risk having to inquire, “What on earth is this?” at any other Chinese restaurants. 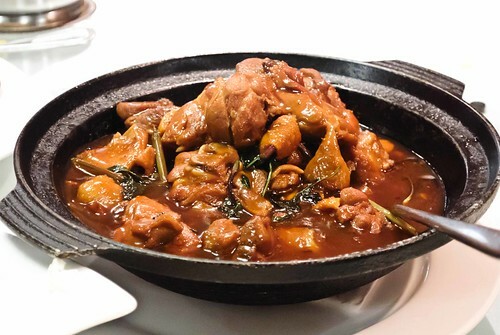 And the three cup chicken, Taiwanese style, was a food lover’s dream. Tender, moist, falling off the bone chicken, swimming in a rich gravy and bursting with each bite, was enough to illicit a smoke immediately afterwards. During the reduction in workforce at the company where we all had left, it seemed that one of the main managers who was a model control freak discovered why the axe loves those in management ranks. We had a moment of silence for him, but only because the server was putting a plate of fried, dried shrimp crepes, and a bowl of spare ribs in front of us. 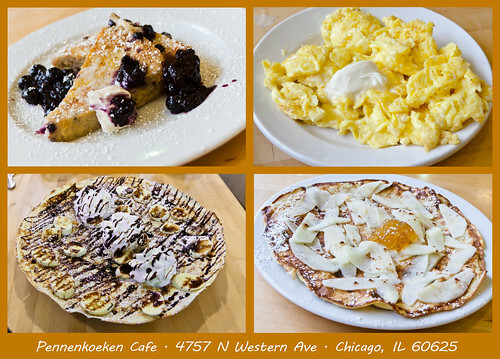 The crepes were a pleasant surprise, although having been served in a sauce, they were not of the texture that you get at French creperies. 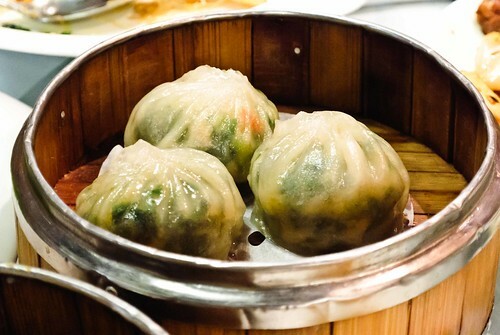 They were, however, like dumplings, but packed with a smile in each bite. It took a while to realize what the spare ribs were. For me, I have always seen them coming off of a grill with a red colouring or drowned in barbecue sauce. Nevertheless, these spare ribs were tastier than any that I have had before — ever. 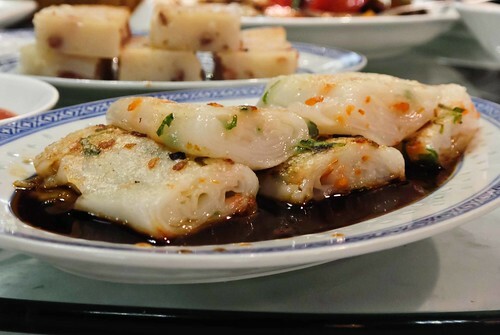 We wrapped up with green chive dumplings that were packed with mustard greens. By now I was surprised that I was able to put any more in my mouth to swallow, let along raise my chopsticks to reach for another bit. But these dumplings were way too inviting to let sit. And believe me when I say that they sat for a short time before going down the hatch. For dessert, we had crispy durian pastry. Who would have thought that biscuits with papaya baked in them could leave five individuals speechless after four hours of non-stop eating and laughter? I am considering calling in for a batch of those biscuits to have for a pre-bed snack at night. Lao You Ju packs out during lunch and I understand why. It is not typical Chinese for Americans. It’s authentic. When you enter the restaurant, you will see a sea of Chinese faces and hear the language accordingly, which is the best indication of authenticity of a restaurant. Aside from travels to Hong Kong and Beijing in mainland China, Vancouver, Toronto, and San Francisco, I haven’t had authentic Chinese food in America except for when my first roommate after college had his parents come to visit and in 2005 when a former colleague had invited one of his Chinese co-workers to meet us at Dragon Court in Chicago’s Chinatown. Now I get to say that I have recently had some more Chinese food prepared correctly thanks for Lao You Ju all because of former colleagues gathering for a small reunion and friendship. For my 40th birthday, my friends at the time had made reservations for a return visit to Kabul House, which was in the Eastern part of Skokie at the time. 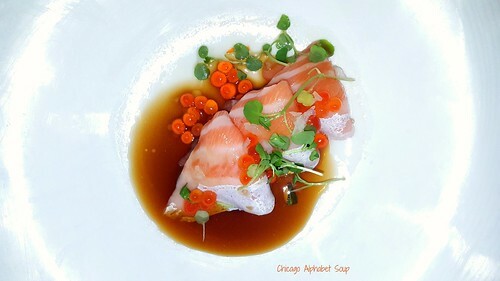 Kabul House was the first restaurant that I had blogged when I started Chicago Alphabet Soup. After going down the list of alphabets, I had never returned to the top of the alphabet for a visit back to Kabul House or to any other Afghani restaurants in the Chicago metropolitan area. I had gone to an Italian restaurant and the web owner sent a beautiful response to my blog write-up of the restaurant and followed up with a recommendation for going to Kabul House. My response was that I had gone to Kabul House, only to discover that the original location I gone to had closed. I was rather disappointed because there were no other Afghani restaurants in the city and the experience was incredible the two times that I had gone. 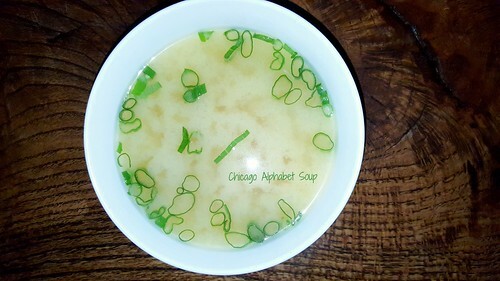 There was a bittersweet moment while having to update Chicago Alphabet Soup accordingly. Fast forward to 2013 and I finally made it a point to go to the new location. 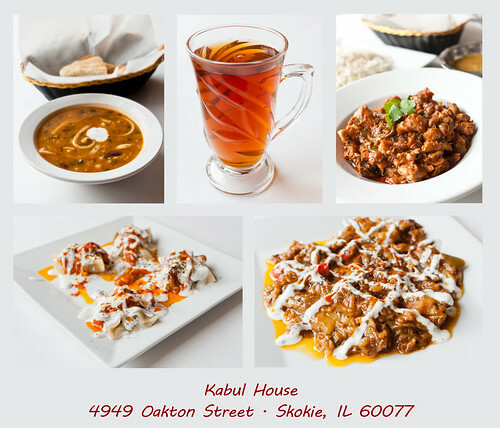 At 4949 Oakton Street in Skokie, Illinois, is the new location for Kabul House. The section of town where it resides has a bit of a residential feel to it with a small booming business location. Only a few weeks ago I was in the area at a neighbouring Jamaican restaurant. 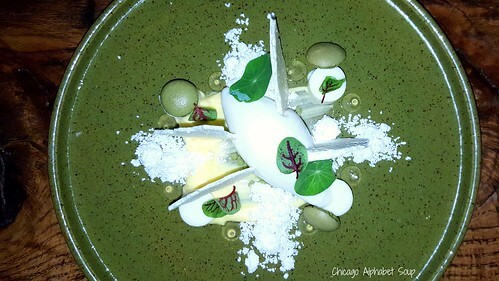 But I had to revisit the place where it all began, albeit at a new locale, so that I could update Chicago Alphabet Soup with current foodtography. Spacious and light on the inside, I sat near a window so that I could have natural light for my compositions. These shots had to be special, although no more special than any other photos I have taken of food. 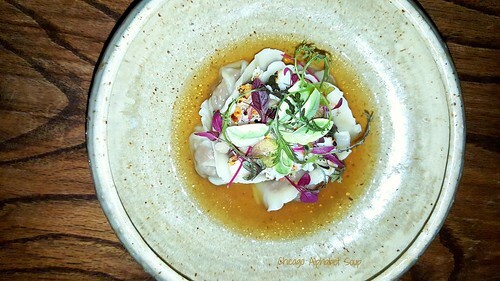 Once the server came to table and warned me that there were some items not available because a private party the night before had wiped them out of some staple dishes that they serve, I relied on recommendations for what I should order. Knowing I was going to capture the impressions of the dishes, I wanted everything linearly so not all dishes came at once and the order was placed accordingly. I started with an aush-rishta. 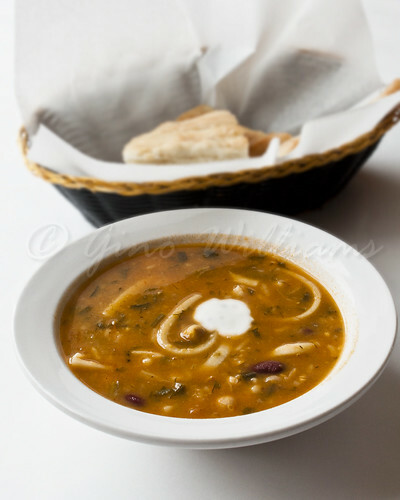 This soup consisted of chickpeas, lentil, red kidney beans, and noodles with fenugreek, parsley, cilantro, and garlic. Immediately after the first slurp, I was reminded of harrira that I have had at Algerian cafes and at some other North African restaurants. There was absolutely nothing disappointing about the soup. And with the soft, homemade bread that came complimentary, I had no shame at all when I took pieces of the bread and sopped of the last of the gravy that was left when I had finished handling the soup. Instead of ordering a cold drink, I had cardamom tea that was bottomless. Being a tea snob, and by that I mean someone who drinks tea that is brewed from loose leaves as opposed to from tea bags, I can vouch that this tea is not from tea bags. You could taste the cardamom, not just a hint of it. And it went very, very well with the soup. Where things kicked up a notch, not as though the soup had gotten me off to a bad start, I had mantoo. There are actually two versions of the mantoo — appetizer and entrée. I settled for the appetizer size. My diet is still that of a pescatarian primarily, but I did recall the dish the first time I had gone to Kabul House, which was before I had modified my diet. 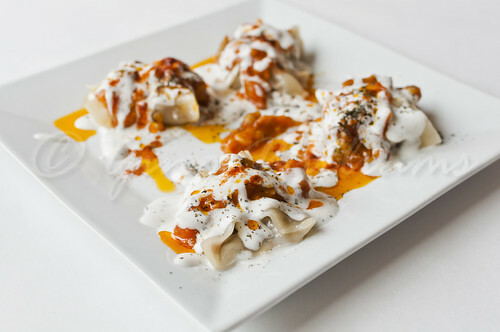 The mantoo was a plate of steamed dumplings that were filled with spiced ground beef, shredded carrots, and onions then topped with a tomato meat sauce and yogurt mint sauce. These were four dumplings that painted my face with a permanent smile. 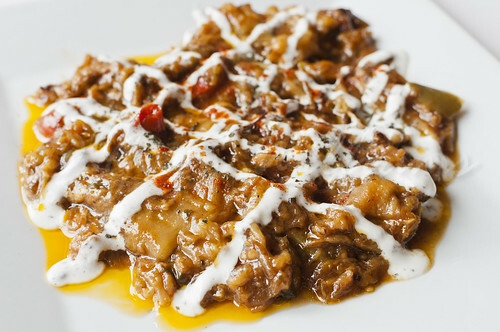 For my second appetizer, I had boranee baunjan, which was baby eggplant baked with fresh tomatoes and garlic and then topped with a yogurt-mint sauce. 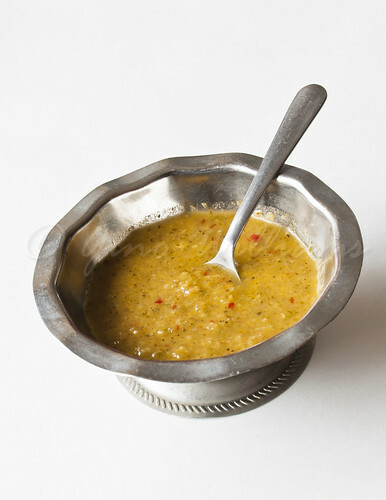 I kept thinking of the Indian dish baigan bharta, but the boranee baunjan has so much more bloom to the taste. Where most restaurants would be a bit heavy on salt, this was not the case with Kabul House. Now, one thing to note is that the two appetizers seemed to be a bit oily, not greasy, though. Although I have a high degree of food snobbery, I have no chef talents to be able to see if the oil was indeed grease. It was light, almost like olive oil. But some people run rampant in frenzies whenever their dishes seem to “run.” I got no indigestion, so I am going to say that the appetizers were heavy with olive oil. 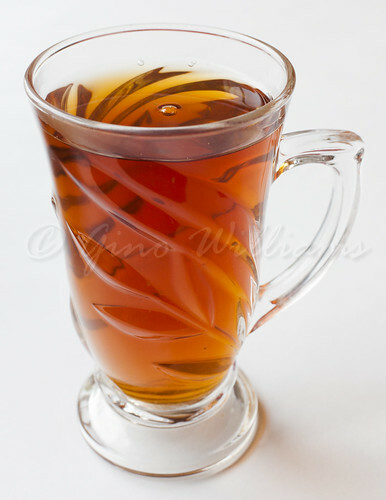 Then again, the hot tea works wonders with digestion. 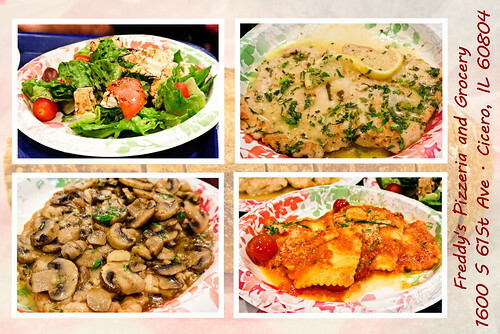 There was one entrée that I wanted to attempt, given the soup and two filling appetizers that I had already tackled. I had a murgh chalau that came with complimentary rice, a spicy lentil sauce, and more bread. Again, there was what appeared to be a slight heavy hand with olive oil as part of the base, but not to point of making the dish unappetizing. 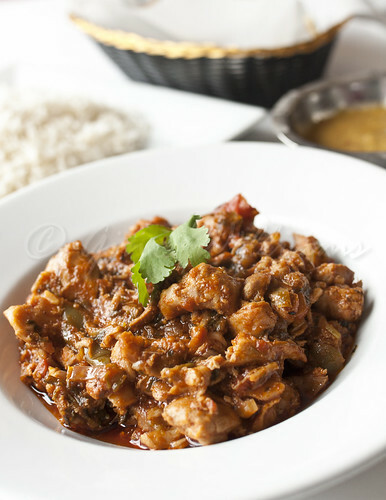 Of all chicken dishes I love, Indian murgh makhani is my favourite. Well, it was my favourite until I had a murgh chalau at Kabul House. Sautéed chicken cooked with garlic and onions in a tomato base left me decisive about how much it is now my all-time favourite chicken dish. And American diners who think that Indian restaurants should have fried chicken tenders on their menu are saying that they know the best fried chicken shacks and barbecue chicken shanties that would make me change my mind — or make me become a staunch vegan. Nevertheless, I ate as much of the murgh chalau as I could and requested a to-go box because although I did not want the moment to end, I wanted to relish the flavours of the dish later. 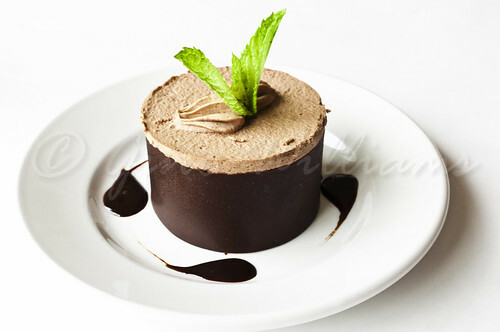 Getting the remainder of it for take-away meant I got to enjoy a mocha chocolate flourless cake. Sure there was baklava on the dessert menu. There was even honey cake, but my gums would still be throbbing from the sweetness. So I accepted the recommendation for the flourless cake and gobbled it up with the appreciation of a rabid prude. I can’t tell you how much I love chocolate and the mocha chocolate flourless cake will be one secret I keep from my high school sweetheart so that she does not use it against me. I was pleasantly surprised to discover that Kabul House retained the authenticity in its food. Having recently gone to an Indian restaurant that had morphed into what looks like a Miami lounge and seemingly tempered its food for the American palates that frequent the area where the restaurant resides, I found a great deal of happiness in the spices, bursts of flavours, and genuine kick to the food at Kabul House. The location may have changed, but thank God the food did not. When I had mentioned that I had a few visits to the first location, the server seemed glad to know that Kabul House remained on my list of favourites such that I came back. 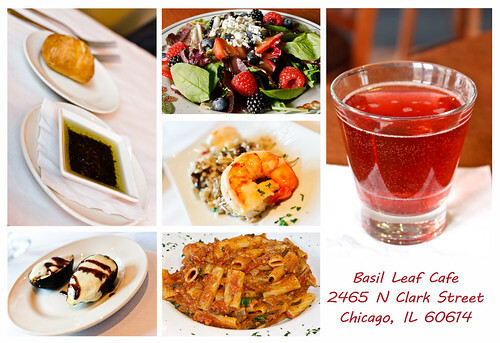 He was outstanding with his recommendations and that was one of the things I remembered fondly at the old location. The prices are splendid even for a budget conscious person and unlike the ubiquitous bill of fare consisting of humus, couscous, and other Middle Eastern fare, there is the influence of flavours coming in from Pakistan, Turkey, and quite possibly from India that will have me rushing up to Skokie now and then for some of the best Afghani cuisine outside of the country. I shall be satisfied. You will too when you get your feet under a table at Kabul House.